Intimus 1000 C Cross Cut Shredder is a utilitarian document shredder that is fit for small scale offices. It is manufactured with the highest standards of quality and usability in mind by the industrial leader, Martin Yale. This cross cut shredder can handle the needs of up to two users simultaneously. It has an exceptional shredding capacity of 9 sheets of paper that it shreds at a quick speed of 7.8 feet/min. Its easy to use feed unit it has a 9” wide feed throat which accommodates all paper sizes up to A4. Its robust cutting unit can shred numerous materials including credit cards. The precision engineered cutting blades it is installed with convert everything to 1/8” x 2” cross cut particles, offering an adequate level of security to firms. It has a security rating of P-3 due to this ability. 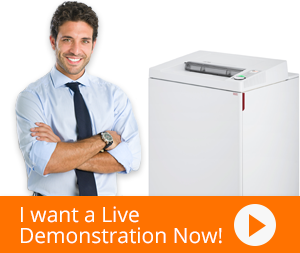 This paper shredder is one of the most intuitive in the markets owing to its technologies. All controlling options are available in one LED control display that makes it easy to operate it. Intimus 1000 C also boasts automated functions. It has a light barrier that removes the need to manually turn it on/off each time it is used; these operations are performed as soon as paper is fed into the throat. Additionally, it includes visual indicators for bin full, bin open, standby, and paper jam. These are crucial in helping to maintain a healthy and safe work environment. A 5.4 gallon catch basket makes waste disposal manageable for consumers.